The Vatican II Hymnal is the only Hymnal . . . When it comes to reproducing Liturgical texts, the USCCB has rules for all kinds of circumstances. 4. In particular, from the approved liturgical books to the simplest participation aids, publications should provide the greatest possible diversity and options, as expected by the liturgical reform. 36. The reformed liturgy offers a variety of options, encourages ministerial creativity, and at times admits a diversity of forms. The participation aid should be so designed as not to establish, once and for all, a single or rigid pattern of liturgical celebration. 37. The arrangement or selection of liturgical texts must not result in the suppression of alternatives and options for the congregation (or for the celebrant and other ministers, as applicable). Taken from the USCCB guidelines. The British guidelines also have these exact directives. Is the Vatican II Hymnal the only “participation aid” in existence which fulfills the requirements of the USCCB? I have not found a single other publication which includes certain IMPORTANT options. 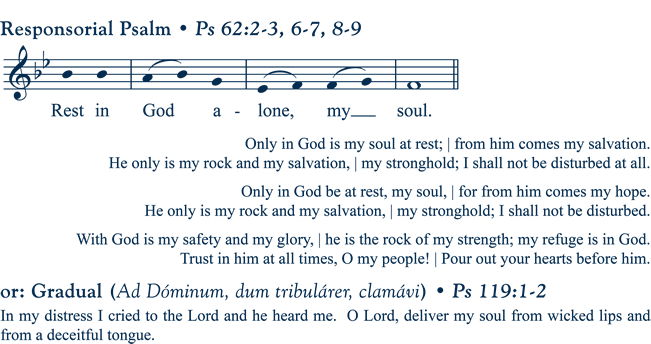 For example, Catholics have a choice after the first reading: Gradual or Responsorial Psalm? But every book, hymnal, missal, and order of worship I have ever seen SUPRESSES the option of the Gradual by not including it on even a single Sunday or Feast.